PATUXENT RIVER, Md. --– The MQ-4C Triton Unmanned Aircraft System (UAS) arrived at Naval Air Station Patuxent River Sept. 18 after completing its inaugural cross-country ferry flight, bringing the Navy closer to delivering this new capability to the fleet. This flight marked the transition from initial flight test, which established basic safety of flight, to testing that will demonstrate Triton’s capability to perform operational missions in the maritime domain. Winter, along with the flight crew and members from the Triton’s Persistent Maritime Unmanned Systems Program Office Office (PMA-262), witnessed the historic landing at 7:53 a.m. During the approximately 11-hour 3,290 nautical mile flight originating from Northrop Grumman’s Palmdale, California, facility, the Triton flew along the southern U.S. border, the Gulf of Mexico and across Florida via an approved instrument route. Operators navigated the aircraft up the Atlantic Coast and Chesapeake Bay at altitudes in excess of 50,000 feet to ensure there were no conflicts with civilian air traffic. Hoke said this perfect execution was no surprise to him since the system has exceeded performance standards during the course of the last year. Triton has completed 15 test flights prior to today's ferry flight, demonstrating its ability to operate at various speeds and altitudes. PMA-262 has scheduled Triton operations to start at Pax River within the next several weeks. The Triton integrated test team will conduct further envelope expansion, sensor, communications and interoperability testing. PALMDALE, Calif. --- The first U.S. Navy MQ-4C Triton unmanned aircraft system (UAS) has completed a flight from California to Maryland. 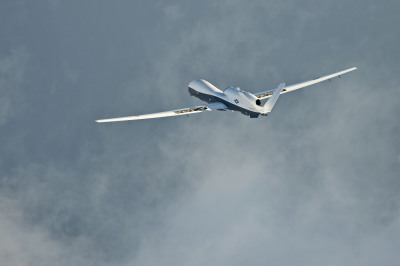 The UAS flew 11 hours from the Northrop Grumman Corporation (NOC) facility in Palmdale to Naval Air Station Patuxent River to start its next phase of testing, moving the program closer toward operational assessment. Northrop Grumman is the prime contractor for the Navy's MQ-4C Triton UAS program.